Regular dental care is essential to your horse’s health. Properly maintained, horses can have good functional teeth well into their 20’s. Many of the severe abnormalities seen in older horses can be prevented when diagnosed and treated early. You care about your horse. You want him to be comfortable, shiny, full of energy and free of pain. You look at his coat, his legs, the condition of his hooves and the light in his eyes, but you really don’t look at his teeth. In fact, it is almost impossible to see the surfaces of your horse’s molars without special tools. If he’s just a baby, are you sure his incisors are aligned so his jaws will develop correctly? If your horse is starting into training are you sure the signals he’s given by halter or snaffle bit don’t cause pain as they push his gums against sharp enamel points of the cheek teeth? Did he lose his baby (deciduous) teeth on time? Do you wonder about the bumps under his jaw? Does your riding horse sometimes balk when you turn him one direction or toss his head when you ask him to flex at the poll? Are you sure the problem isn’t in his mouth? What about that loyal old horse in the pasture who has lost a little weight and smells a little musty around the mouth? Have you seen him dropping wads of grass or hay? The most important goals of regular veterinary dental care are maintaining teeth as long as possible—correcting abnormal wear patterns before they cause periodontal disease and tooth loss-- and preventing or relieving pain. The AAEP considered dentistry to be so important that it was the topic of the focus meeting in 2008. This, and the following articles will be your dental primer, for the life of your horse, from the first year to the last. We demand more of performance horses at a very young age. We have halters, hackamores and bits in and around their teeth and jaws, placing pressure on an area that is shedding baby teeth and adding permanent teeth at a rapid rate (horses lose 24 baby teeth and erupt 36-40 permanent teeth between the ages of 1 and 5). We often select breeding animals without regard to dental considerations. Sometimes crossbred horses will have mismatched upper and lower jaws. Short-headed horses have less room for teeth and problems can develop from crowding. Miniature horses almost always have dental abnormalities. Natural selection for positive dental traits through survivability in the wild has therefore been largely eliminated in domestic horses. Horses’ teeth erupt or emerge from their jawbones into the mouth continually—about 1/8 inch per year-- throughout their lives and are gradually worn down by grinding roughage. Because the upper jaw of the horse is wider by 30% than the lower jaw, as the horse grinds its food with a sideways motion sharp enamel points tend to form along the edges of the teeth. These points are most prominent on the outside of the upper cheek teeth (premolars and molars) and on the inside of the lower cheek teeth. These points can cause pain during chewing and also with pressure from halters and bridles. Most horses will benefit from yearly dental care or at least should be examined yearly. A complete evaluation requires use of a full-mouth speculum, under sedation, with a bright light and dental mirror to visualize the entire mouth. Weanlings and yearlings should be checked for early developing problems just as all 2 and 3 year olds should have their mouths examined prior to entering training. Competition horses especially should be checked every six months for any problems that could reduce their performance level. 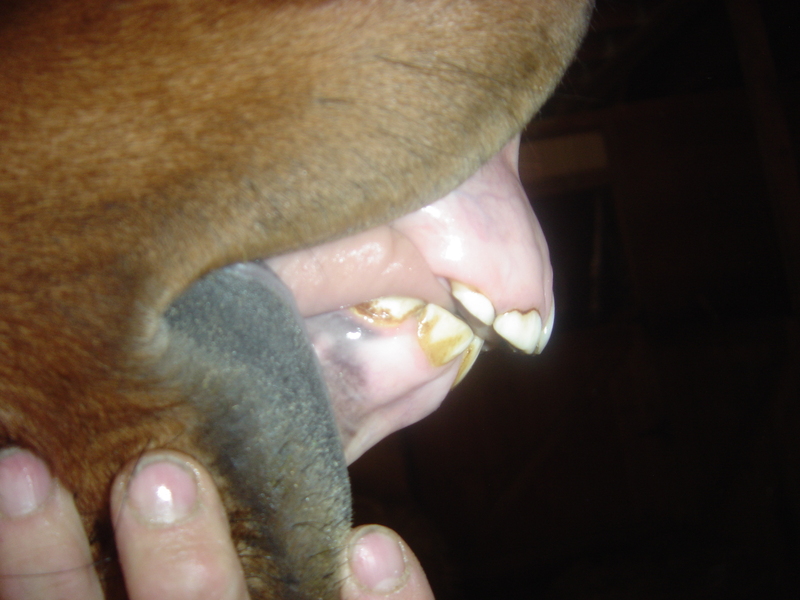 Lacerations on the cheeks and on the tongue are common in young horses in training from these sharp enamel points. Grinding off the points is indicated before the young horse enters training. Older horses (17 and up) have their own set of potential problems such as gum disease or gaps between teeth retaining food, leading to periodontal disease, excessively worn teeth, loosening teeth, and root abscesses. Again, early identification and treatment can benefit the horse. Other common dental problems are: retained deciduous (baby) teeth, called “caps”; sharp wolf teeth that interfere with bit placement; hooks on upper front premolars and lower back molars; broken or missing teeth; unevenly worn or protruding incisor (front) teeth. A “wave mouth” results when some cheek teeth become dominant and wear their opposite teeth excessively. 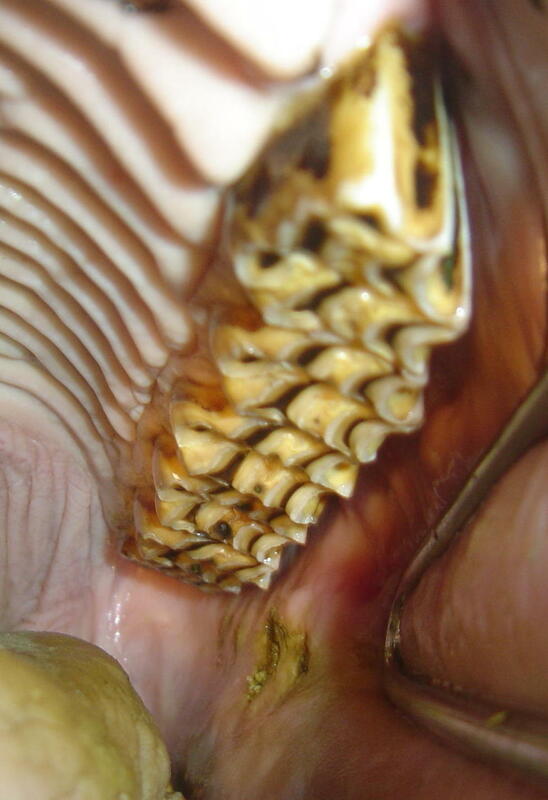 An “S” shaped or “wave” pattern of the occlusal surface then develops. Any of the above problems can lead to difficult chewing, poor feed utilization, stiffness in the head and neck, trouble with the bit, tongue lolling, head throwing, or even bucking. In addition to identifying existing problems, there are some proactive procedures that can benefit your horse. 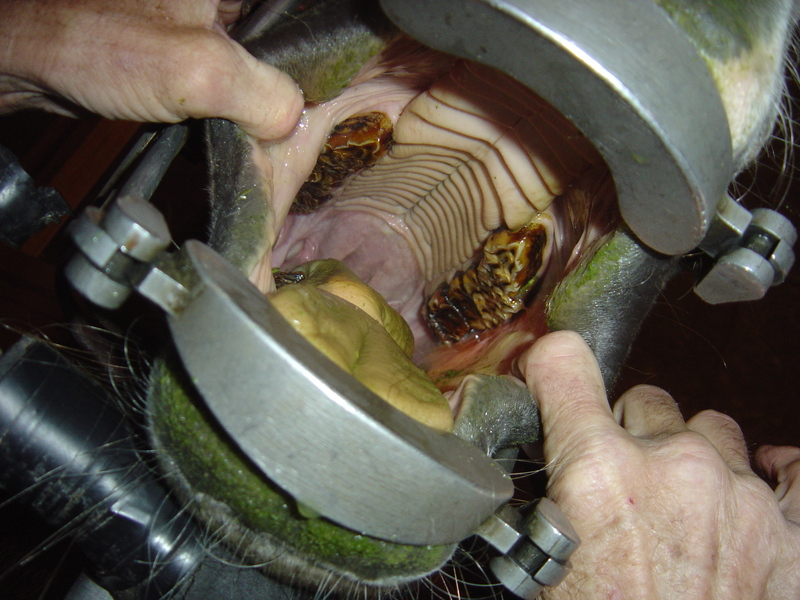 Incisor overbites, sometimes called “Parrot Mouth”, may need to be treated in young horses. This abnormality can be identified very early in life and minor corrections of the foal’s deciduous incisors can help to eliminate or minimize future problems with the development of cheek teeth hooks associated with overbites. More severe overbites may require orthodontic appliances. Incisor teeth that are too long relative to the cheek teeth can cause severe chewing problems, especially later in life. Horses who do not graze on a regular basis will not wear their incisors as rapidly as their cheek teeth. We can shorten the incisors slightly which will allow more normal chewing. Power tools are routinely utilized to reduce the time needed to correct problems that have been identified. Large, thick hooks or overly long incisors can be ground down with carbide or diamond chip attachments. This is all accomplished under sedation so that the horse is not unduly alarmed. Sedation also provides a quieter more comfortable patient and increased safety for the horse, handler, and veterinarian. Pain relieving medications may be added during dental procedures as well as local anesthetics, and oral pain relief following the needed dental corrections.